The Portuguese in their discovery phase, looking for spices and trade, sailed into Goa in western India in 1510 and stayed put for more than 450 years till they relinquished the territory to India in 1961. 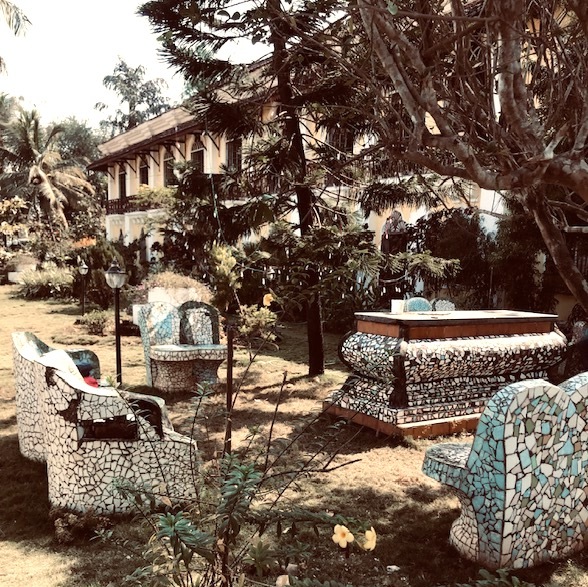 The occupancy left its mark in 17th-century churches and palatial Portuguese homes straddling the rural and urban areas of North and South Goa such as Chandor (the Braganza House), Loutolim (Casa Araujo Alvares) and Quepem (Palacio do Deao). These enduring legacies of Portuguese architecture, along with a vibrant cultural ambiance, negates the premise that the smallest state of India with nearly 102 kilometres of uninterrupted coastline and aqua extravaganza is all beaches. Most of these homes are open to public and we visit the Braganza Mansion in Chandor, an hour plus long drive from Panjim (42.6 km) via rice plantations and surging sea. Panjim is the capital of Goa. The Braganza Mansion: The sprawling 350-year old Braganza Mansion, over 10,000 square meters, near the church square in Chandor is one of the most exquisite Portuguese heritage homes in the countryside. 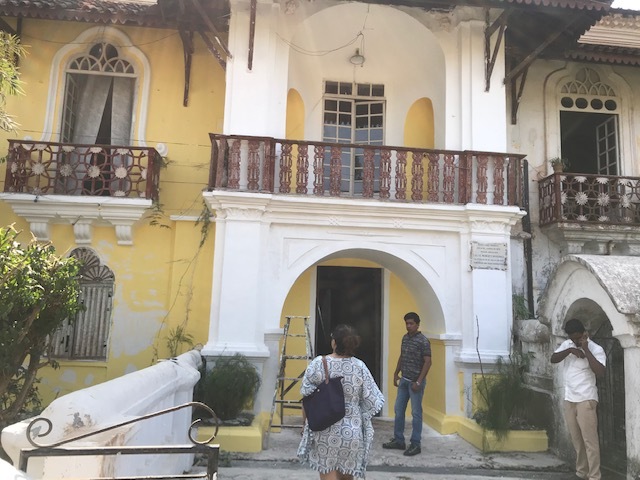 The Portuguese style outer façade is entry to both wings and I counted about 24 windows and balconies, supposedly the longest in Goa. The present entrance is not very impressive or maybe the owners want to project the ancient look complimented by a run-down garden with mosaic chairs, tables and fountains. We go up the stairs to the partitioned house, occupied by two branches of the Braganza family, and led to the Braganza –Pereira side. The reason the Pereira family is welcoming, are friendly and let you photograph the artifacts. The opposite side, the Menzes side, the descendant lady is supposedly rude, does not allow photographs and a staff member shows around visitors. An ‘all-business’ young man introduced him-self as a Braganza scion (could not catch the generational prefix) and took charge of our tour. It was all rush-rush with constant phone calls and an ongoing wedding shoot in the Grand Ballroom. There are special booking rates for commercial shootings. All through our visit his mother, the owner of the mansion, remained seated in a straight-backed (antique) chair on the balcony. She reminded me of the taciturn Miss Havesham (Charles Dickens–Great Expectations 1861) stoically surveying the disappearing glory. We were left on our own, free to walk around and take pictures of the surrounding antiquity. I am enamored by the pieces on display, the pictures, the furniture, the commode in the bedroom, the Portuguese chests, palanquins, the 350-year-old Ming vases and Chinese porcelain collected by the occupants of the house over hundreds of years, the massive Belgian crystal chandeliers in the ballroom, the dining table and chairs, including the ones gifted to the Braganza family by Dom Luis, the king of Portugal in the 19th century. The family chapel boasts of an unusual relic — a jewel-encrusted fingernail of Saint Francis Xavier. Equally fascinating are the doors and their arty borders. 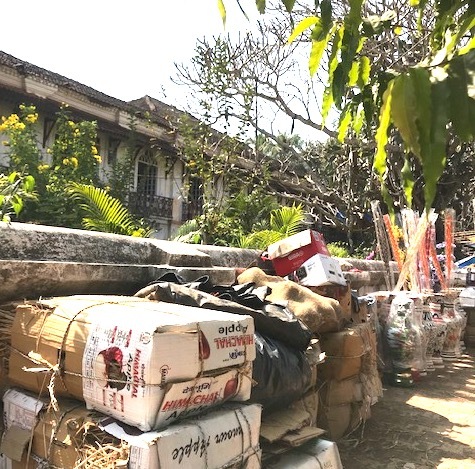 The tour lasted maximum half-an-hour and before we could fathom or register the factualness of the stories and tales connected with the display, our guide excused himself, took the donation-entrance money and greeted the next lot of visitors. Maybe he set the tone of the visit and instead of checking out individual displays by asking ‘when was that made or purchased’ we viewed the house in totality…..a Portuguese mansion. The mansion’s history, recounted by the young man, is equally glitzy. The Braganza’s were originally an influential Hindu family converted to Christianity by the Jesuit mission led by Saint Francis Xavier in 1542. Their century long loyalty to the Portuguese government was acknowledged by the Portuguese King granting them land for the present mansion as well as the name of the last royal house of Portugal (Braganza). The coat of arms is on display in the ballroom. The reason for the divided house was that few generations ago there were no male heirs and the house was left to the two daughters and named after their husbands… Menzes –Braganza (West Wing) and Braganza Pereira (East Wing). The family enjoyed the trappings of privilege till 1950s when they had to flee as a family member joined the freedom struggle against Portuguese rule. They returned after Goa became an Indian state in 1961. An hour spent viewing the passages, peeping into bedrooms and corners we stepped out. I tried taking pictures of the partitioned next door (West Wing) only to be screamed out that ‘you have not paid the donation’. Location: Approximately 10 kilometers southeast of Margao via the Chandor-Margao Road. Opening Hours: From 10 a.m. until 5 p.m. Some of our walking friends are great fans of Goa, Indra. They regard it as a warm haven in the winter months when it can get quite cool here in the Algarve. It’s all relative, isn’t it? 🙂 🙂 I have tended to think of it as largely beaches but I have to admit that on this evidence I could be very tempted next winter. Thanks a lot! The images with the shadows (IMG_6180 is my favorite) from The Braganza Mansion are particularly notable! And the history of the place is fascinating. Hope to see it with my own eyes next time around!